After a nail-biting silence, European scientists are back in touch with a probe currently descending to the face of a comet speeding through deep space. 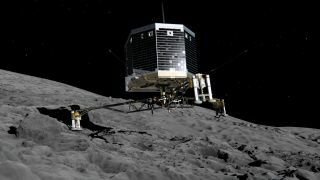 As expected, European Space Agency (ESA) officials regained contact with the Rosetta mission's Philae lander at 6:07 a.m. EST (1107 GMT) today (Nov. 12) after the probe was released from its Rosetta mothership earlier in the morning. Officials are expecting to have pictures of Philae's descent later this morning, so check Space.com's comet landing complete coverage page to see them when they are released.